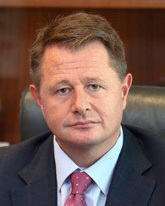 Mr. Hourican currently serves as the chief executive officer of the Bank. He previously served as chief executive of The Royal Bank of Scotland Group’s Investment Bank (Markets & International Banking) from October 2008 until February 2013. Between 2007 and 2008 he served on behalf of a consortium of banks (RBS, Fortis and Santander) as chief financial officer of ABN AMRO Group and as a member of its managing board. He joined RBS in 1997 and is a leveraged finance banker. He held a variety of senior positions within RBS’s wholesale banking division, notably on the division’s board as finance director and chief operating officer. He also ran RBS’s leveraged finance business in Europe and Asia. Mr. Hourican started his career at Price Waterhouse and he is a fellow of the Institute of Chartered Accountants in Ireland. Mr. Hourican is a graduate of the National University of Ireland and Dublin City University.